Round Traditional Sapphire and Diamond Vintage Engagement Ring | Shane Co.
A stunning display of traditional sapphires and diamonds beautifully alternate and graduate in size as they are channel-set in this cathedral styled engagement ring. Two sapphires are bezel-set on either profile of this ring and are accompanied by a vintage-inspired engraved detailing along the band. The choice is yours in selecting a center diamond to complete this engagement ring. 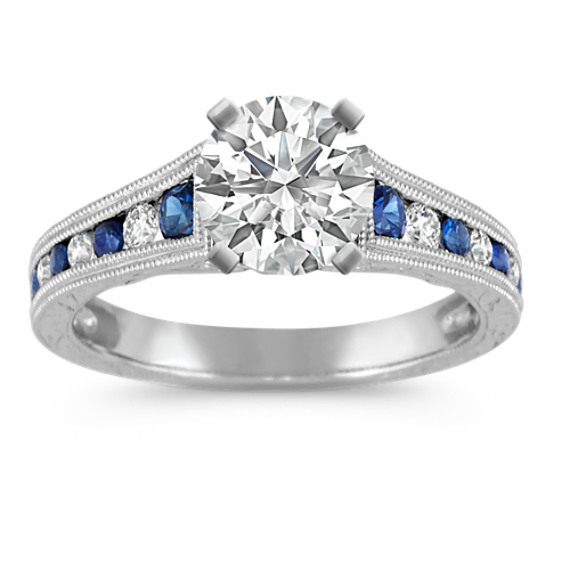 This ring is crafted of quality 14 karat white gold and features 12 round traditional blue sapphires (approx. .39 carat TW) and ten round diamonds (approx. .16 carat TW). The width of this setting ranges from 3-4mm as it widens at the top of the cathedral design. The total gem weight of this ring is approximately .55 carat.